A student walked into class late on Tuesday morning, the first day back from break. The teacher asked him where his pass was. He replied with alarm: “The attendance office is gone!” The teacher chose not to send him to get a pass. Early in the week, a student received a pass from the attendance office asking him to report to the office immediately. At that point the teacher still had no idea where the attendance office was and so in handing the pass to the student simply told him, “Good luck,” and sent him on his way. To reach the guidance and activities offices without stepping on the new tile (which needs to lie still for a day or two before it can be walked on), visitors had to walk through the downstairs entry to the new wing, up the first set of stairs, down the hall of the new wing, down the elevator, and down one more hallway. Reports of seeing Little Red Riding Hood picking wildflowers slightly off the trail were unconfirmed, as were the rumors of the Minotaur being discovered in the classroom next to the activities office. The situation left everyone wishing there was such a thing as Stupendously Quick-curing Mortar and Grout for the tile. Even that might not have helped, however, since Tuesday night someone walked on it, forcing the tile crew to restart a section. Surely each tile ruined sprang a new gray hair in Mr. Talley’s head. We should note that we haven’t actually inspected Mr. Talley for gray hair, but if he makes it through this addition without any, he should win some kind of award. If you doubt the correlation between stress and gray hair, our understanding at the Pine Needle is that it has been scientifically confirmed that high levels of stress can lead to gray hair. What levels of stress lead to pink hair is not known, but we have a hunch it is off the charts, given the the quantity of pink in principals’ secretary Mandy Hennies’s hair. Meanwhile, the aforementioned elevator proved to be a source of headache as it broke down early in the week, prompting counselors to volunteer that when they needed a student, they’d come and get them themselves rather than send the students on a wild goose chase. The elevator began working again, however, but not for too long. 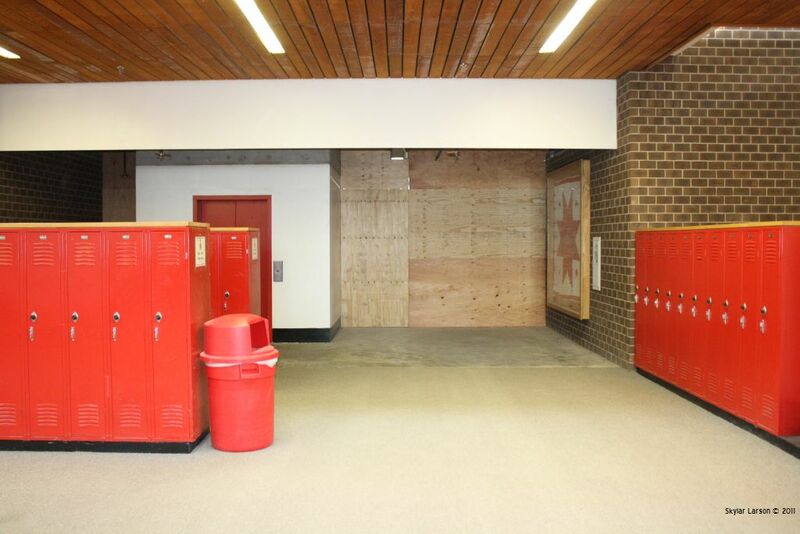 On Thursday a number of students found themselves stuck inside it. It turned out not to be a problem solving activity for class but an actual problem. They were soon liberated; however, this brings to mind the guy a few years ago in his office building who was trapped in an elevator for 41 hours. Come to think of it, perhaps the party who walked on the unfinished tile had known about that guy and was too terrified to use the elevator? We may never know.